Babies may be little, but they come with a LOT of stuff. That’s why mamas need a roomy, functional diaper bag designed to hold everything they’ll need to get through the day. Trouble is, a lot of these bags just look boring, frumpy, or juvenile. We want stylish diaper bags that don’t scream “diaper bag”. The kind of diaper bag that’ll get the job done, but is cute enough that you still feel stylish carrying it. 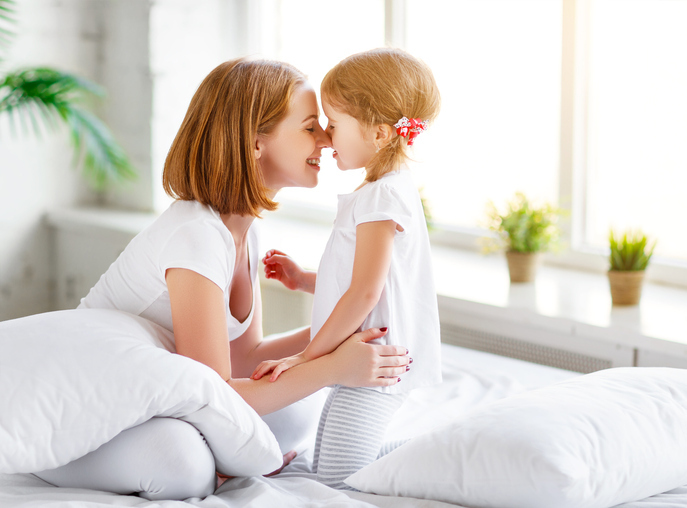 Moms often feel forced to sacrifice style for function and frankly, we’re sick of it. Are stylish diaper bags too much to ask for? No, they’re not. And to prove it, we’ve rounded up our favorite cute diaper bags that look like something you might have carried before you had cheerios in your car and pacifiers in your purse. You’ll still get all the pockets you need, but you’ll also get fashionable hardware and cute details that make these stylish diaper bags something you can carry from day to night. Without further ado, here’s 9 functional yet stylish diaper bags you’ll actually want to carry. No one will ever know they’re full of bottles and wipes. Shhhh…It’ll be our little secret. The Isoki Madame Polly is a smart looking vegan-leather bag that’s so cute, you’ll probably end up wanting to use as a purse for yourself. 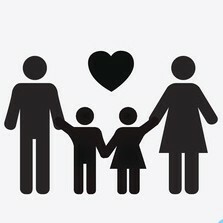 The bag comes with adjustable shoulder straps and removable stroller clips. It’s also got all the pockets you need to fit a bottle carrier, diapers, and padded changing pad. Stylish and functional. How cute is this Miss Fong bag? It was designed by a mom who really wanted a diaper bag that didn’t look anything like a baby bag. She succeeded! This bag comes with 6 outer and 7 inner pockets. It also includes a stroller strap and changing pad. What’s really cool is there are two strap options, a long shoulder strap or a webbing strap, whichever best suits your needs and style. 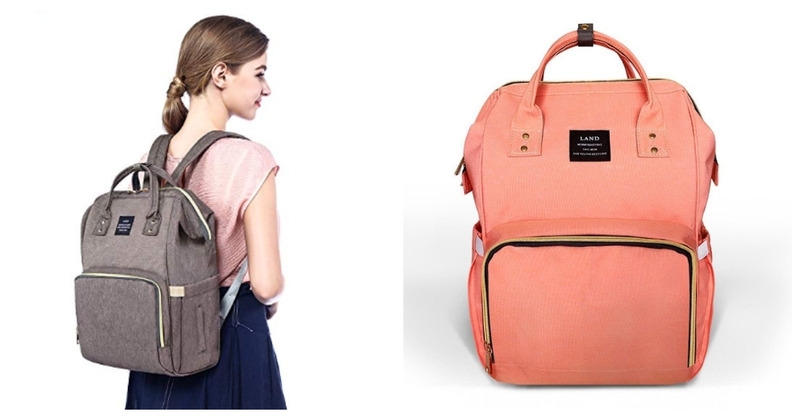 This Skip Hop bag is one of our favorite stylish diaper bags. 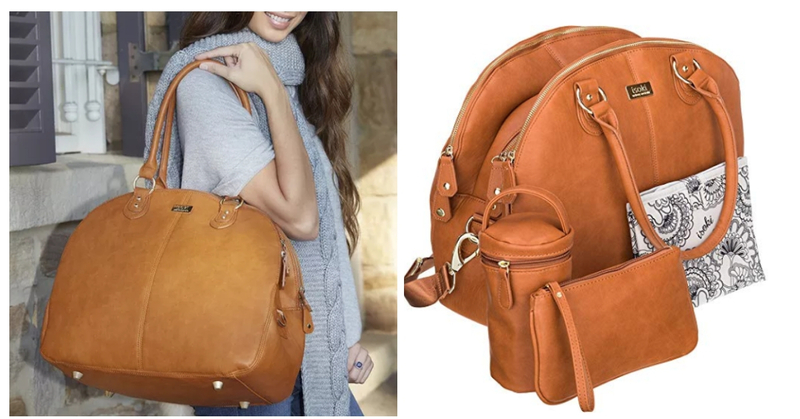 It’s a pretty vegan-leather bag with a changing-pad pocket, adjustable straps, and top handle for easy toting. It comes with a washable changing pad, stroller straps, and so many pockets! You’ll be surprised how much baby gear you can fit in here. 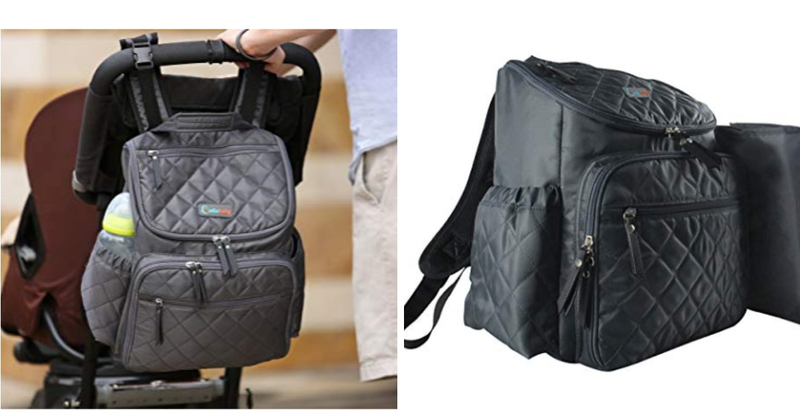 Check out this cute quilted diaper bag you can easily wipe clean. 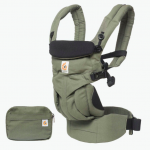 It’s got all the pockets, clip-on stroller straps and a built-in detachable changing pad. What’s really cool is the added back padding that makes it super comfortable to carry. And at less than $40, this bag is a great value too! 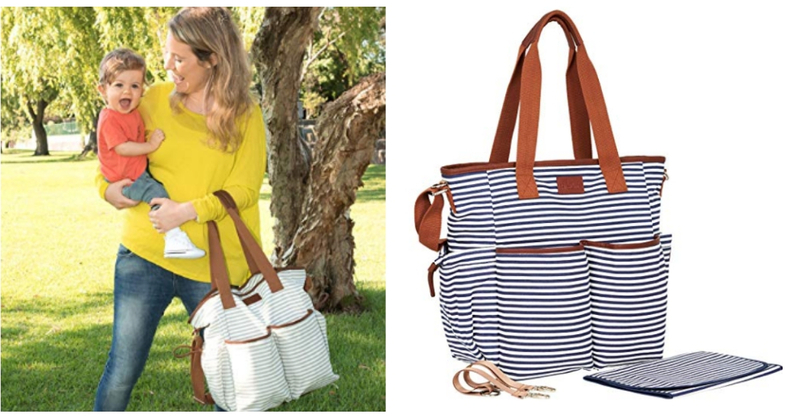 If you’re a tote bag kinda girl, then this diaper bag from Hip Cub is the bag for you! It looks just like something you’d take on a weekend getaway, but it’s got 9 secure pockets, a stroller strap, and portable changing pad so it works for baby too. We like the cute front pockets and the fact that the cotton canvas is easy to clean. 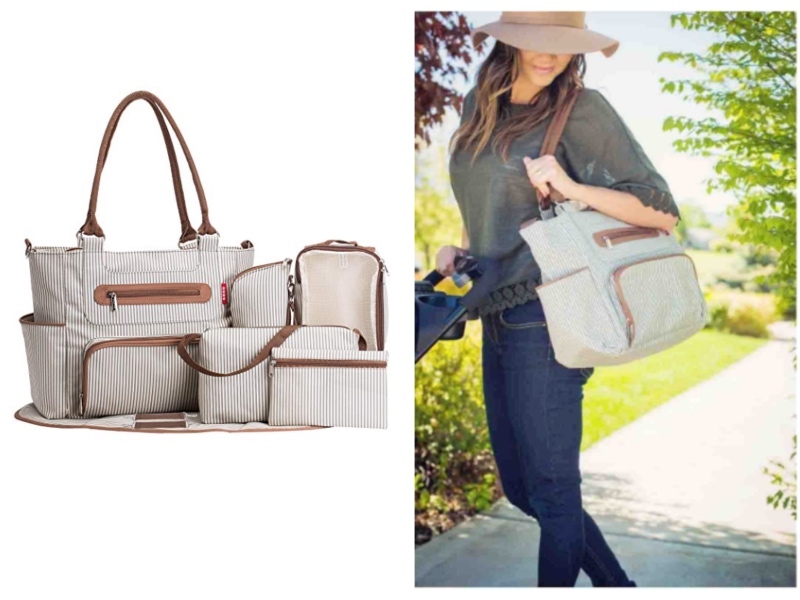 These are great stylish diaper bags for busy mamas on the go. 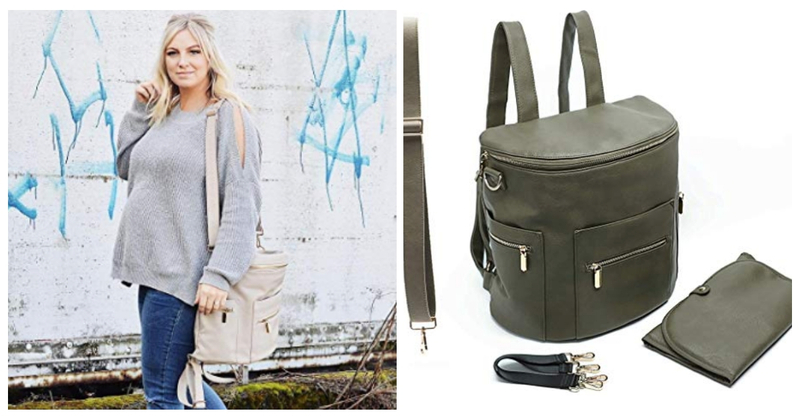 This bag nation diaper bag allows you to be completely hands free and with its classic gender-neutral backpack styling, no one would ever know it was a baby bag! Which makes this the perfect bag for you AND dad to share. This bags has thousands of five star reviews on Amazon and for good reason. 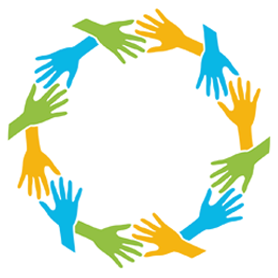 It comes with a lifetime warranty and Bag Nation is known for their excellent quality and customer service. This reliable bag will not let you down. The HaloVa Land bag is super cute and super functional. It’s got 3 insulated pockets to keep mil warm, it’s water resistant and easy to wipe clean. 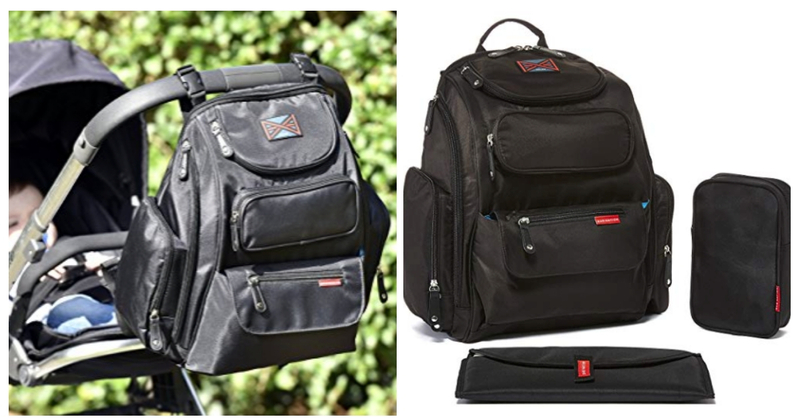 And at less than $40, it’s one of the best value bags out there. A solid choice for stylish diaper bags. The Annie is the professional breast pump bag you’ve been looking for. It’s stylish, tall enough to fit the largest laptops vertically, and it literally carries everything you need including your breast pump. For busy working moms this bag is a Godsend! 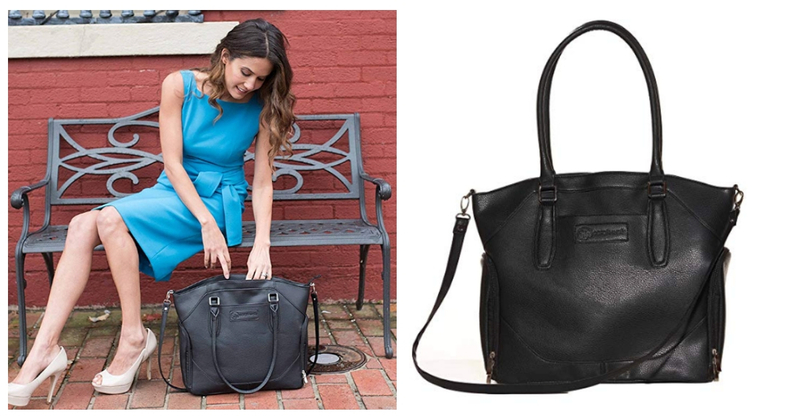 The faux black leather and silver hardware make it look like your office carry-all. Only we know better (wink, wink). 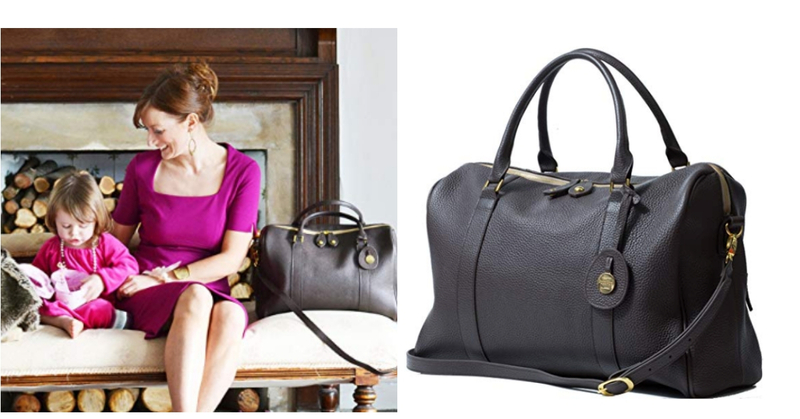 The Firenze bag is our high-end luxury add to our list of stylish diaper bags. If you haven’t heard of PacaPod, they’re a UK brand started by a mom who wanted to create functional yet fashionable nappy bags. They’re just making their way to this side of the pond and we think they’re divine. This bag is made out of beautifully smooth cowhide leather and it comes with all the bells and whistles. 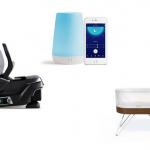 Plus the styling is so cute, we might even carry it on a night out without baby. The Soho Grand Central Station bag has everything you need, and we mean everything. Plus, it’s water resistant in case someone spills. This is a 7-piece set that features multiple pockets, a small personal purse, accessory cases, insulated zippered bottle bag, a padded changing station, and more. If you’re the kind of mamma that carries a LOT of stuff, but wants to look cute and put together while doing it… then this is the bag for you. 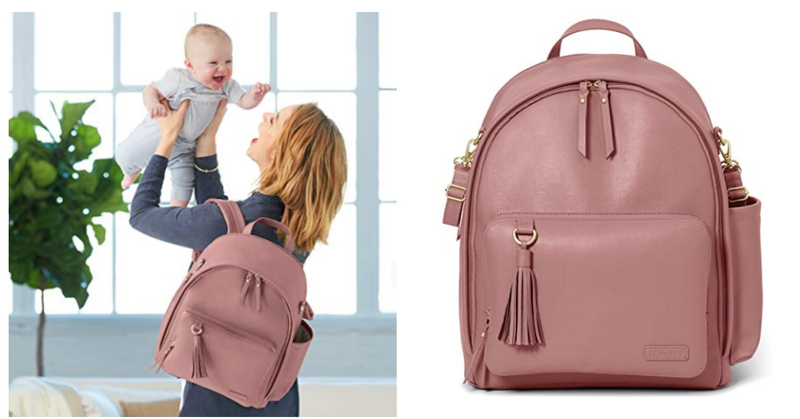 SHARE these stylish diaper bags you’ll actually want to carry on Facebook and Pinterest by clicking the buttons below.